The Wharf is buzzing with construction activity, as structural steel framing for the new Wharf Hall at Parcel 2 is out of the ground and pillars for the apartment building there are now above ground. Meanwhile, the apartment building at Parcel 4A has now reached the fourth floor and VIO condos (Parcel 4B) is not far behind. 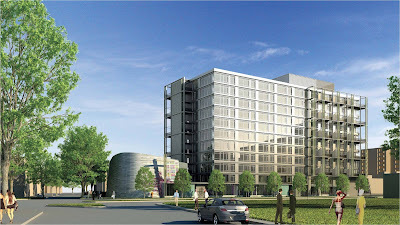 It was announced in Globest.com that Hoffman Madison Waterfront received construction financing for the dual Canopy by Hilton/Hyatt House hotel project on Parcel 5 adjacent to 7th Street Park. Starting next month, 7th Street at Maine Avenue will be closed to vehicular traffic so work can get started at 7th Street Park. Also in May, traffic will reopen on Water Street and M Place around the new 525 Water condo building and St. Augustine’s Church, the former of which looks almost complete. Utility work continues at the new Waterfront Park adjacent to 525 Water condos. Construction on the park is expected to be complete late this year. Work on extending the commercial Pier 4 continues. Look here for more information on what’s planned at the new Pier 4. A pair of construction cameras have been set up so you can keep track of what’s going on at The Wharf. 525 Water/St. Augustine's should open in 2016 while the rest of phase one should be complete by the fall of 2017. SWBID will soon be moving from their temporary quarters at Arena Stage to the ground floor of Patriots Plaza on 4th Street, across the street from the CFL. The BID has begun ramping up operations since it was formed last year. One of the most visible signs has been the "Clean Team", which can be seen sprucing up the area. Also, new outdoor furniture was installed in the SW lot of Waterfront Station at 4th and M streets, where AYA Markets will return later this spring for their weekly Saturday morning farmers market. The monthly Market SW night market will also be back on the fourth Friday of each month starting on May 27 through October 28. Vendors who are interested in participating can find an application here. Another activation space within the BID will be located at Maryland Avenue and 7th Street, where food trucks gather during lunchtime to feed the thousands of Federal employees who work in the area. Construction equipment has finally arrived on site at Delaware Avenue and M Street, which will be transformed into a new sanctuary for St. Matthew’s Lutheran Church and a 221-unit apartment building. The sanctuary will be at the corner of Delaware Avenue and M Street and the 11-story apartment building will run along M Street. Chain link fencing has been up around the site for years, but in the past few days, a construction trailer arrived along with backhoes, and Delaware Avenue was closed on Monday as construction crews started digging in the street. Parking restrictions on both sides of Delaware Avenue are expected for the next two months as utility work is done for the project, but restrictions on the west side of the street will last longer since it will take about two years to finish construction. The St. Matthew’s project is a long time coming – the PUD was approved in November 2012 and a two-year extension was requested in late 2014. This is the second rental apartment building to start construction over the past couple of months in the quadrant. Construction began last month at 301 M Street, located cattycorner from the St. Matthew’s site. Within the next few months, two more apartment buildings will get underway. Construction on two new rental apartment buildings on the parking lots of the View at Waterfront apartments on 6th and M streets and 6th and K streets should get started this summer (a new name for this project will be announced soon). The new multipurpose turf field at Randall Recreation Center has a new name which may sound familiar to Nationals fans…the Ryan Zimmerman Field will officially open this Saturday with a ribbon cutting at 10am. The festivities begin at 8:30am with “fun and games” and concludes with an inaugural baseball game at 10:30am. Guests will include the aforementioned Zimmerman, Nationals manager Dusty Baker, Mayor Muriel Bowser, Ward 6 Council member Charles Allen, ANC 6D commissioners, and other dignitaries. All are welcome to attend. The field was redone this past fall and winter by a partnership between DPR/DGS, the Nationals Dream Foundation, the Cal Ripken ?Sr. Foundation, and Under Armour, which includes baseball and soccer fields. At last Saturday’s second Greenleaf community meeting, consultants from HR&A Advisors revealed a potential redevelopment plan for Greenleaf, which calls for a phased redevelopment of the 15-acre public housing complex. The plan would rebuild the 493 units of public housing that currently exist at Greenleaf as well as another 1,374 units of market-rate housing, in a mix of 1-, 2-, 3-bedroom and townhome units. Since many of the existing Greenleaf units are townhomes, a portion of the replacement Greenleaf units will also be townhomes. The preferred redevelopment option would be to build the first phase outside the Greenleaf footprint, but in the vicinity, so Greenleaf residents won’t need to leave the community. A “Build First” model is something many in the community have advocated for and has the support of the ANC and the DC Council. Several District and federally-owned sites were identified as possible locations for building the initial phase of 127 units under the “Build First” model. This would allow the redevelopment of the block of 38 townhomes between L and M streets to proceed without displacing residents because the families in the townhome units can be moved to the new off-site building. 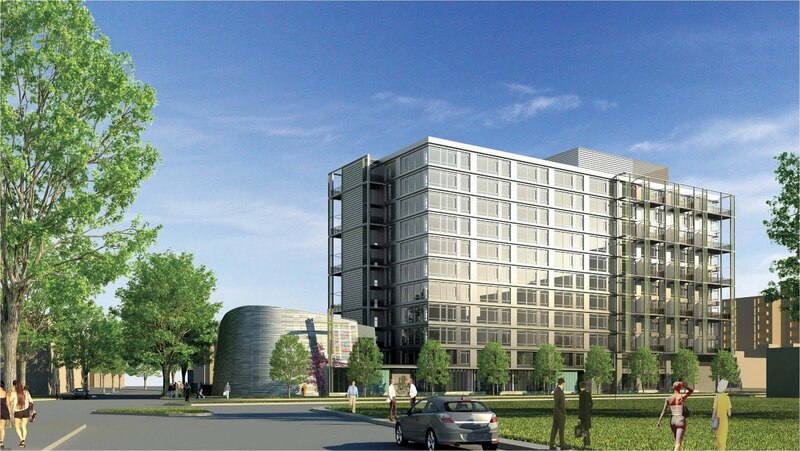 The initial phase inside the Greenleaf boundaries would be a high-rise building on the north side of M Street with 271 units for seniors, with the potential for ground floor retail. Once that building is complete, the current seniors building on the south side of M would be replaced with another high-rise with 662 units of mixed income housing, including flats and townhomes on the first two levels. Phase three on-site includes 240 units – townhomes where the Greenleaf mid-rise building is now and a high-rise on the north end of the block between L and M streets. After that phase is complete, a mix of 336 mid-rise and townhome units can be built on the block between K and L streets. Development would conclude with more mid-rise and townhome units (336 units) on the northernmost block between I and K streets. This is just a preliminary plan and could change before the final plan is released this summer. A third community meeting will be held in May where the plan will be fleshed out further. Construction is still several years away, but having a framework will allow the Housing Authority to seek a developer partner to help bring the vision of a mixed income Greenleaf to reality.